IPCC welcome volunteers to help us in our work to save the bogs of Ireland and their wildlife. Anyone that has some spare time, would like work experience or simply has an interest in nature and would like to help a good cause can volunteer with us. Volunteer – This is What Needs to be Done? to help with mail outs and much more. Whatever your task may be, as volunteer you contribute to the success of the Irish Peatland Conservation Council, and provide an important link between us and the local community. 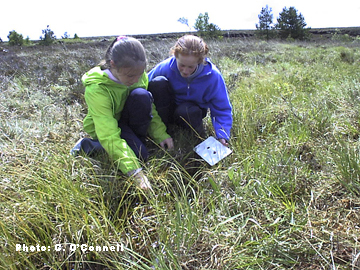 Most of our volunteers work from the Bog of Allen Nature Centre in Co. Kildare. Getting to the nature centre is the hardest part because you really do need to have your own transport. Most volunteers like to arrive at 10am in the morning and they leave at 4pm. The most successful volunteers are those who can give either one day a week of their time for between 6 months and a year or give a full time commitment for 2 to 6 months. This way you can get stuck into a project and feel you are making a real difference. And being around for a longer time means you can make new friends while you volunteer. You can volunteer weekend events and open days that IPCC organise. Most of our visitors like a hot cup of tea or coffee when they arrive, so you could end up looking after them. Some of our volunteers, particularly those who work on stamp sorting do so from their own homes. So this is a possibility as well. If you would like to learn more about volunteering for the IPCC please download a copy of our Volunteer with IPCC Leaflet, complete and submit the volunteering form below or come out to the centre and meet our team. © Irish Peatland Conservation Council, Bog of Allen Nature Centre, Lullymore, Rathangan, Co. Kildare. Email: bogs@ipcc.ie; Tel: +353-45-860133.